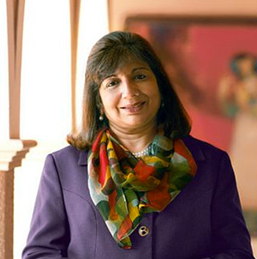 Kiran Mazumdar Shaw is a Non-Executive Director of our Company. Kiran is the Chairperson and Managing Director of Biocon Limited. She is a first generation entrepreneur with more than 42 years experience in the field of biotechnology. She holds a bachelors degree in Science (Zoology Honours) from Bengaluru University and a masters degree in Malting and Brewing from Ballarat College, Melbourne University. She has been awarded with several honorary degrees, including Honorary Doctorate of Science from Ballarat University, National University of Ireland, Trinity College, Dublin and the University of Glasgow. She is the recipient of several national and global awards, the most noteworthy being the 'Padma Shri' and the 'Padma Bhushan' in 1989 and 2005, respectively, conferred by the Government of India. She was also conferred with the 'Ernst & Young Best Entrepreneur: Healthcare & Life Sciences Award (2002)', the 'Economic Times Business Woman of the Year Award (2004)', 'Nikkei Asia Prize for Regional Growth' by Japan’s business daily, Nihon Keizai Shimbun, (2009) and most recently, the 'Othmer Gold Medal' by the U.S. based Chemical Heritage Foundation and '2014 Global Economy Prize' by Germany’s Kiel Institute both in 2014. The prestigious Foreign Policy magazine has named her among the '100 Leading Global Thinkers of 2014'. She has also been named as one of the '100 Most Influential People in the World' by TIME magazine in 2010, '25 Most Influential People in Biopharma' by Fierce Biotech, Asia-Pacific's 'Heroes of Philanthropy (2013)' and '100 Most Powerful Women (2013)' by Forbes magazine. She is also an independent director of the board of Infosys Limited, and is the chairperson of the Indian Institute of Management, Bengaluru. She is a part of the U.S. Pharmacopeial Convention (USP) Board of Trustees. She is a member of Karnataka's Vision Group on Biotechnology and currently chairs this forum. She has setup the Association of Biotech Led Enterprises (ABLE) in 2003 and was its first president. She serves on the National Advisory Council of the Government’s Department of Biotechnology. She is member of the governing body of the Indian Pharmacopoeia Commission, Ministry of Health and Family Welfare, Government of India.